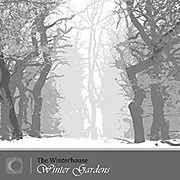 On Winter Gardens (63'21") Anthony Paul Kerby and Robert Davies achieve a tranquil and understated sonic poetry. Recording their fourth CD together as The Winterhouse the duo goes deep into sound's relationship with space. The result is marvelously direct. Winter Gardens conjures snow, ice and frost and a sense of scale - registering in both the brain and the gut. In a genre where there is still room for intuition this music is not about how your ears hear the tones but how your body reacts to its cold emanations. This album has its own drifting rhythm - and it is easy to lose one's bearings in the quiet force of its slow storm. More than just a self-swallowing void Winter Gardens is comprised of six tracks across several sections of slowly shifting drones. The seemingly static opening segments are meant to turn the attention of the listener inward. Once safely chilled the music becomes more harmonically active. Synthesized strings create tension and release as crystalline tones tinkle and twinkle in the hovering reverberation. Maybe there is an electric organ sound, a stretched flute, or some kind of bell ringing through an echo. There might be breathing or metal grinding, and possibly some tape feedback. It is impossible to know. The sounds arise, combine, change and melt away - slowly, as all things sub-zero must. When we play this CD we may feel as if we are hearing something pure, but maybe we are not supposed to be listening - too personal, too dark, too cold.